Apiax builds powerful and flexible tools to master complex financial regulations digitally. Apiax’ technology allows to transform complex regulations into digital regulatory rules and offers financial institutions the opportunity to deploy machine-readable regulations in their applications. Apiax’ cutting-edge technology provides full visibility and control over digital regulatory rules and empowers financial institutions to serve their clients more efficiently and in a fully compliant manner. 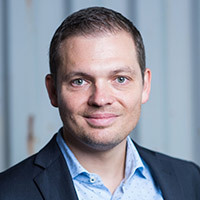 Nicolas Blanchard, CMO and Co-Founder of Apiax, has more than 12 years of experience in the financial service industry. After his career as a software engineer, he graduated with a BSc. in Economics and Marketing from the Lucerne University of Applied Science. Before Apiax, Nicolas Blanchard was Head of Marketing at Appway and built a global, distributed marketing team with offices in Singapore, New York and Zurich. He is also a member of the board at TEDxZurich, helping to create a platform for inspiring ideas.